It’s that time of the year again! 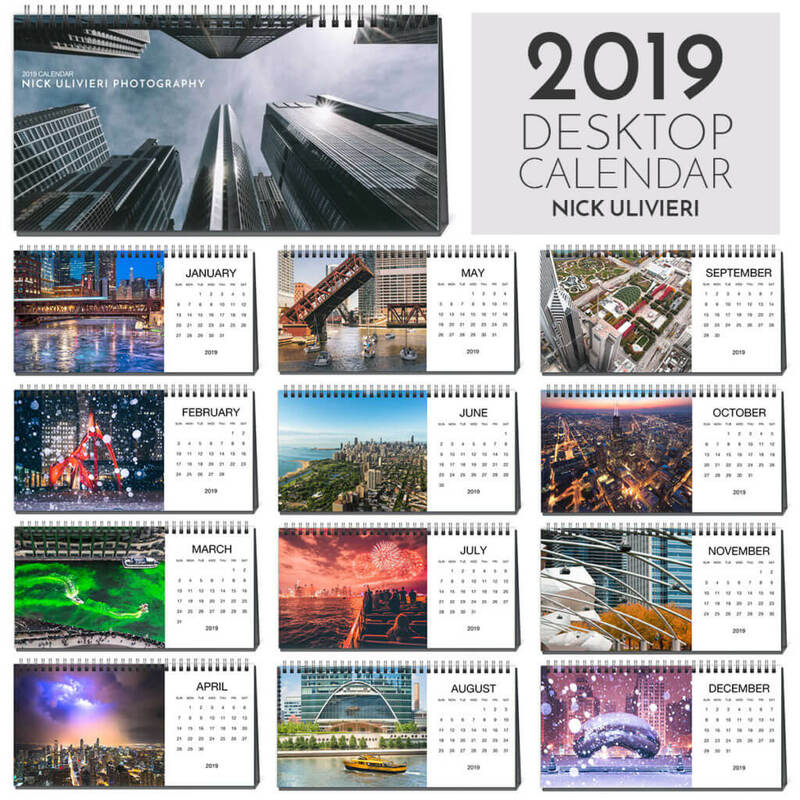 My 2019 calendar full of Chicago cityscapes is here! If you got your hands on a calendar, and are here to learn more about the photos – thanks for stopping by! JANUARY: Between two bouts of the flu and having my wisdom teeth out, the early part of 2018 was a rough one for me. 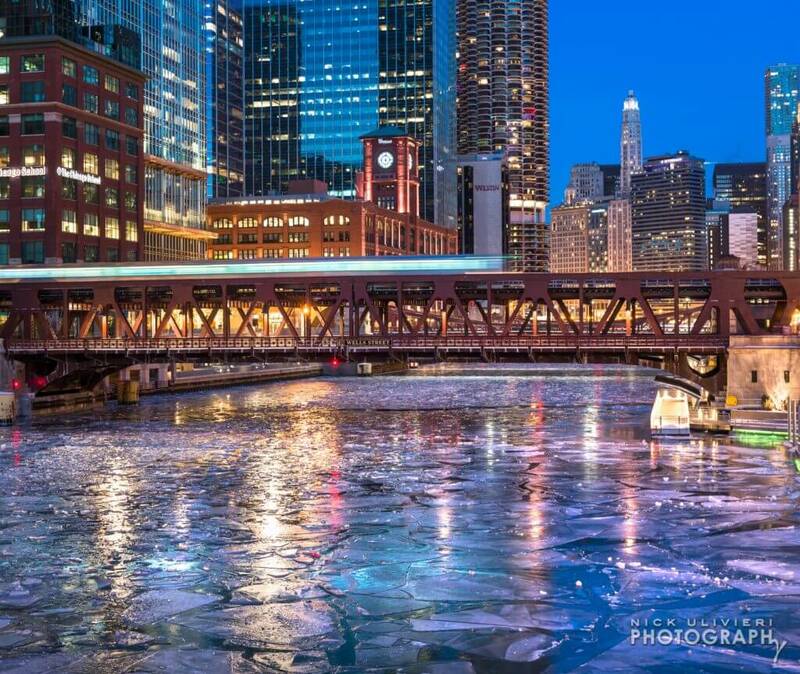 However, there was a small window of relative health when I was able to get out and shoot the Chicago River once it froze over during the first week of 2018. 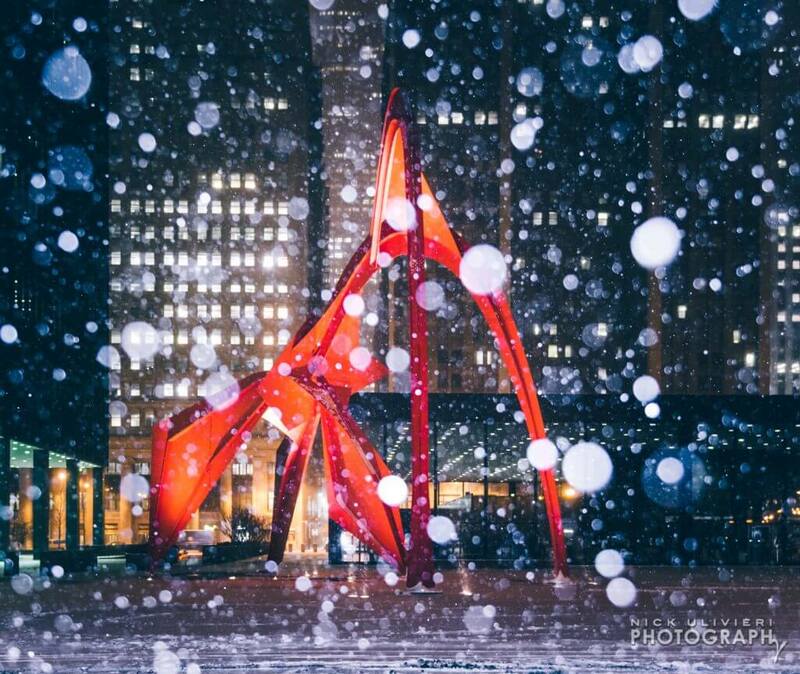 Check out more photos from my frigid photoshoot right here. FEBRUARY: Who doesn’t ❤️Calder’s Flamingo? Especially in the snow! I actually took this photo about a week before Valentine’s Day. This bright pop of red just felt right for the February feature. The “bokeh snow” effect was created by shooing at a wide-open aperture of 2.8 while firing my speedlite to illuminate the snowflakes in front of the lens. MARCH: Out with the red, in with the green! 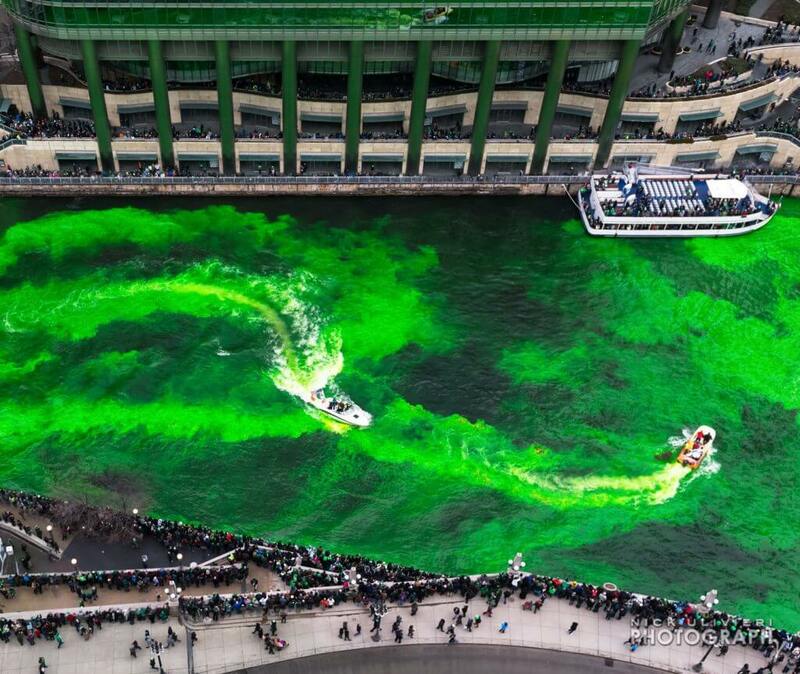 I don’t think a Chicago calendar would be complete without a photo of the St. Patrick’s Day river dyeing. 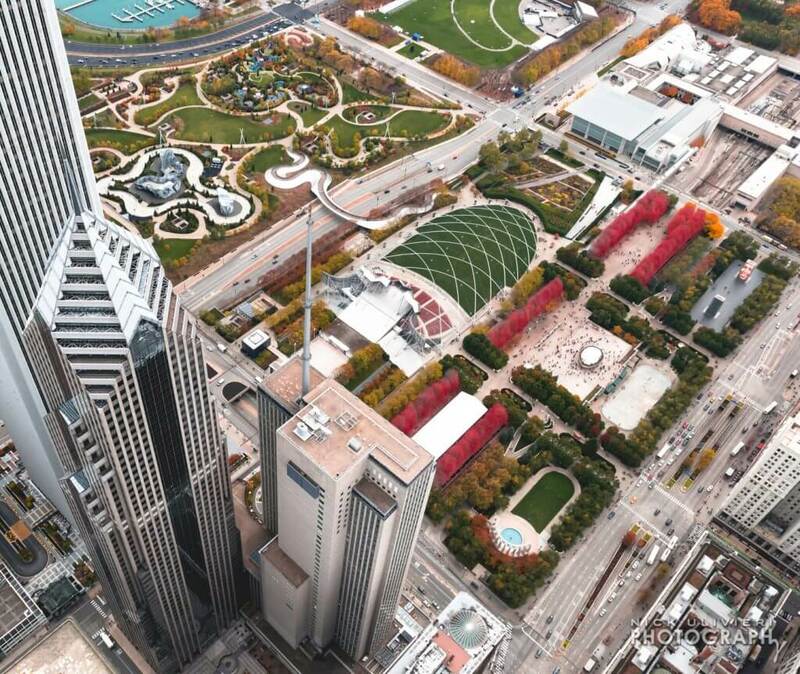 This passed year I spent time shooting and celebrating from atop LondonHouse Chicago. More shots here. APRIL: It was a down year for me in terms of catching lighting, but this early-season storm was quite photogenic. Despite not producing an epic cloud-to-ground bolt, the way this cloud-to-cloud lighting flash lit up the clouds structure was pretty insane. 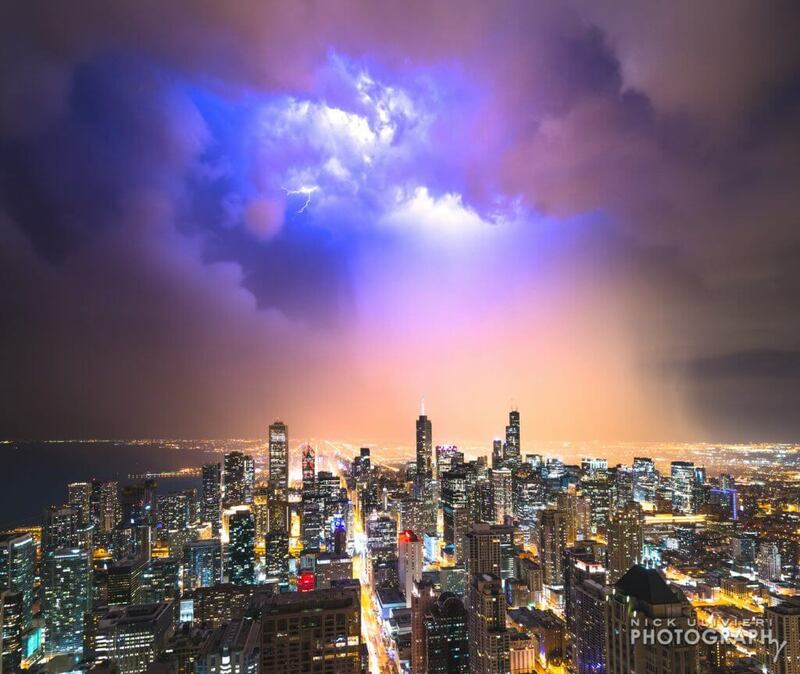 If you didn’t know, I shot this form my favorite storm photography perch – 360Chicago. 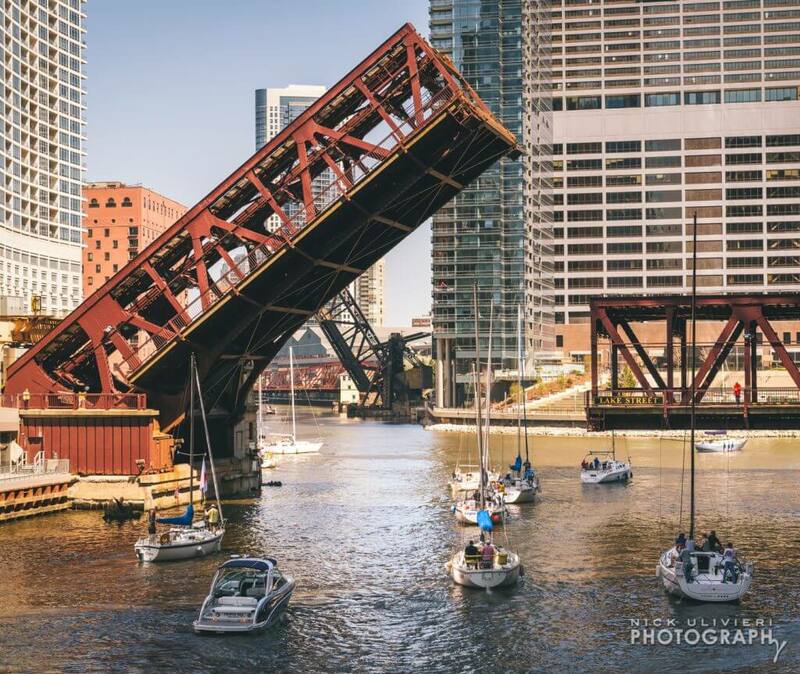 MAY: It’s bridge lift season! By coincidence, I was scouting a project for 150 N Riverside (read more about that project here) when the bridges started going up. Right place, right time. 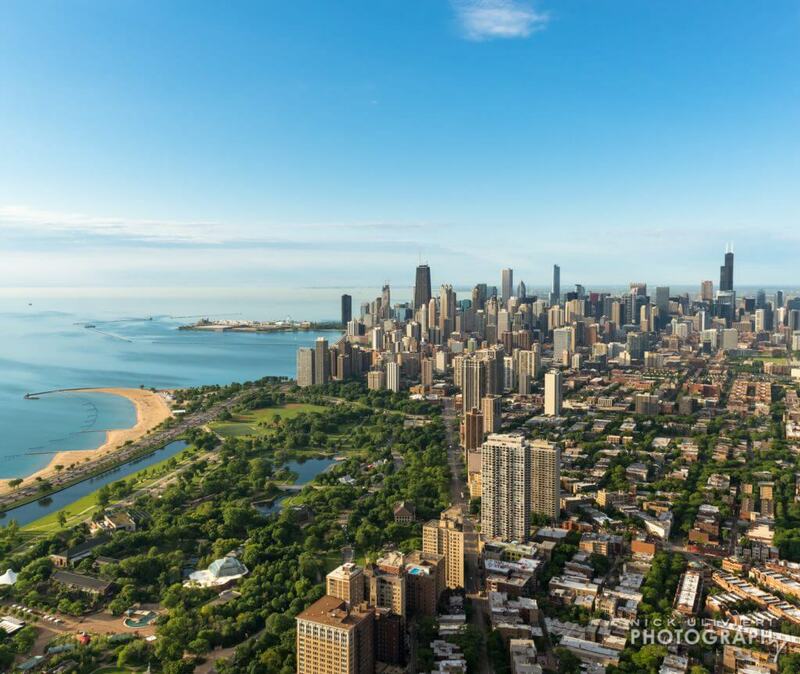 JUNE: The skyline only receives direct, bright light on its north face for a few months of the year making early morning summer helicopter rides with my friends from Rotorzen extra special. 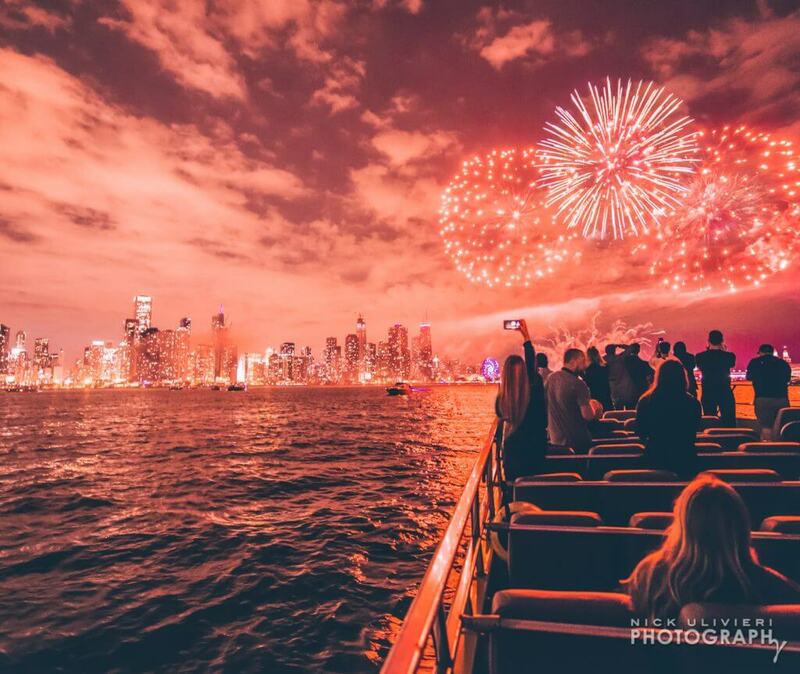 JULY: Photographing fireworks from a rocking & rolling boat without a tripod is tricky, but if you take enough frames, you’re bound to get a few good ones. I snagged this photo during a Seadog fireworks cruise last summer. Here are more photos from that ride. 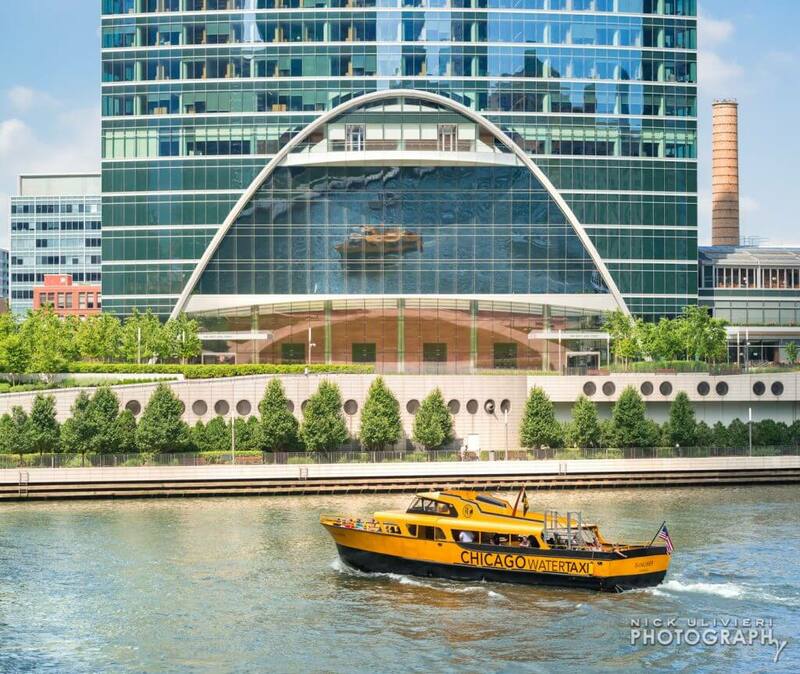 AUGUST: I typically post a photo from the Chicago Air & Water show for August, but because I didn’t get a good Chicago-focused show photo from the 2018 event, I figured this shot of the Chicago Water Taxi on the river, and it’s reflection on River Point, would be a suitable stand-in for the ‘water’ portion of the Air and Water Show. SEPTEMBER: Admittedly, this photos was taken a little bit later last fall, but who doesn’t start to get the fall itch by mid-Septemeber? During this flight, I did a few orbits over Vista tower as it neared topping out. Check them out here. 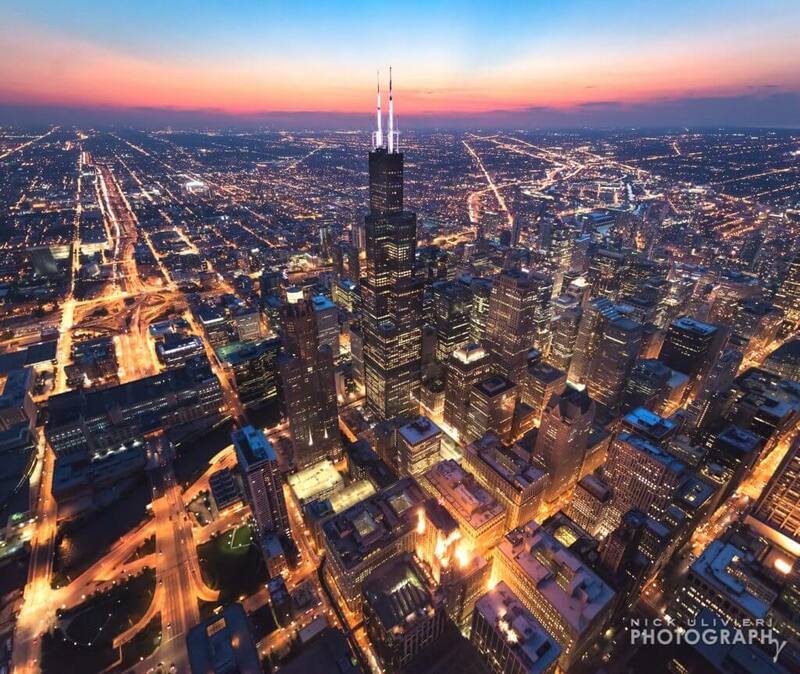 OCTOBER: Few things can beat a Rotorzen helicopter flight at dusk. The shooting conditions are extremely challenging, but just a few sharp photos makes the trip worth it. NOVEMBER: I suppose if the colors of fall lasted too long, they wouldn’t be as special. 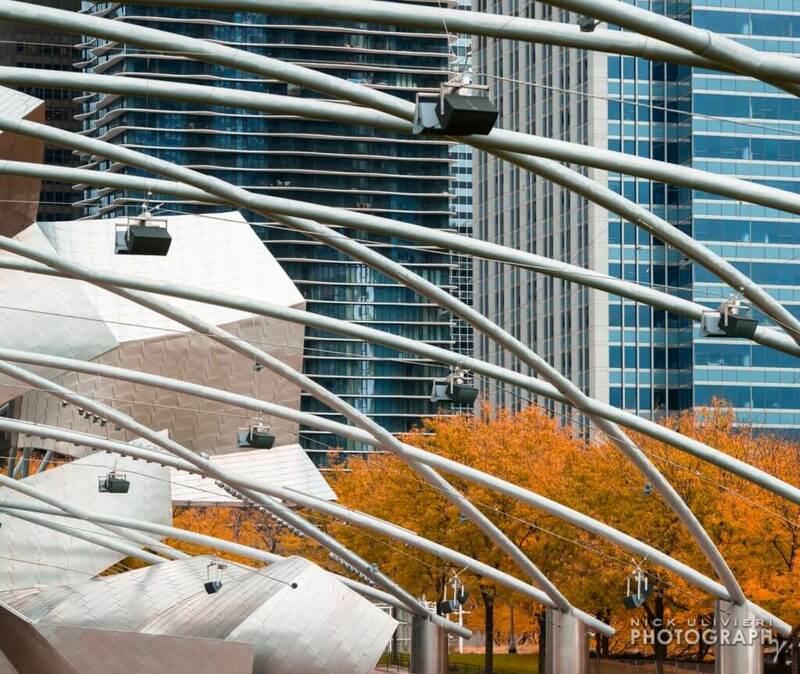 I took this photo on an early November day when the colors of Millennium Park were at peak. I thought the textures and color contrast in this photo were quite striking despite straying a bit from my typical wide-angle, sweeping cityscape style. 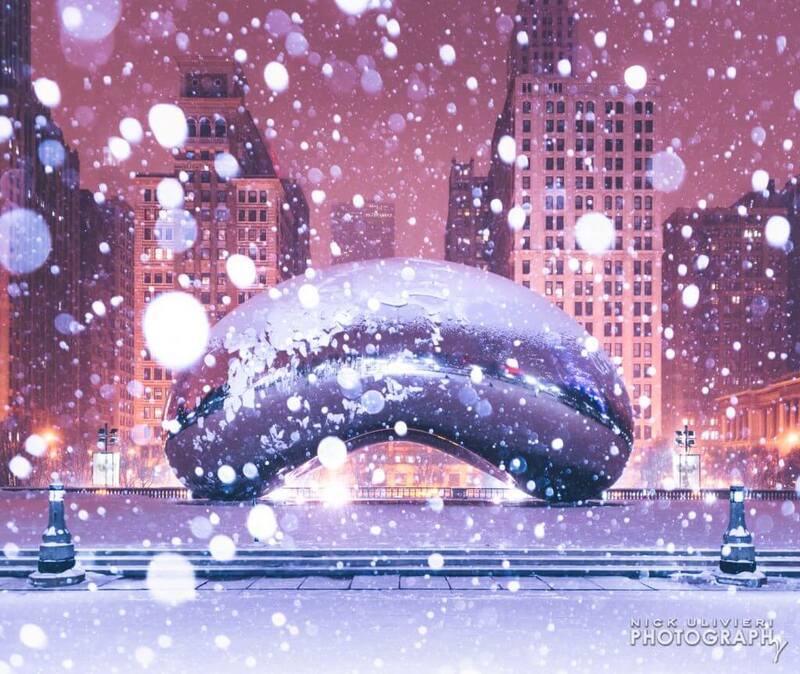 DECEMBER: Here’s another “snow bokeh” shot, this time of Cloud Gate. I’ve had a lot of people ask me how I get shots of ‘The Bean”‘ without anyone around, and the answer is easy: Go when no one else wants to be there. Early in the morning, late at night, or when the weather is terrible are all good times to try.